Atlanta, GA, January 2019: “The 37th Annual Convention and Scientific Assembly of American Association of Physicians of Indian Origin (AAPI) will be held at the fabulous Omni Atlanta at CNN Center and Georgia World Congress Centre (GWCC) in Atlanta from July 3 to 7, 2019,” Dr. Naresh Parikh, President of AAPI, announced here at a kick off meeting. 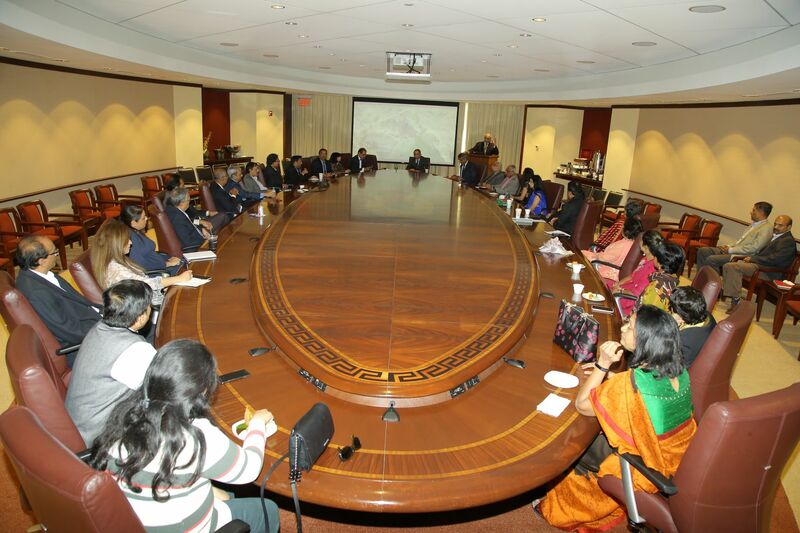 Attended by the members of convention leadership and various Committee Teams for the convention, the event on Sunday, December 2nd, 2018 at the Georgia World Congress Centre, showed the enthusiasm and commitment of the AAPI leadership and the local organizing committee headed by Dr. Sreeni Gangasani, Vice Chair of AAPI BOT and Convention Chair. Other prominent leaders who had attended the kick off meeting included, Dr. Sudhakar Jonnalagadda, Vice President, AAPI; Dr. Syamala Erramilli, President of GAPI; Dr. Asha Parikh, Chair of GAPI BOT; Convention Co-chairs: Dr. Raghu Lolabattu, Dr. Piyush Patel, Dr. Subodh Agrawal and several Convention Team members. Many of the physicians who will attend this convention have excelled in different specialties and subspecialties and occupy high positions as faculty members of medical schools, heads of departments, and executives of hospital staff. 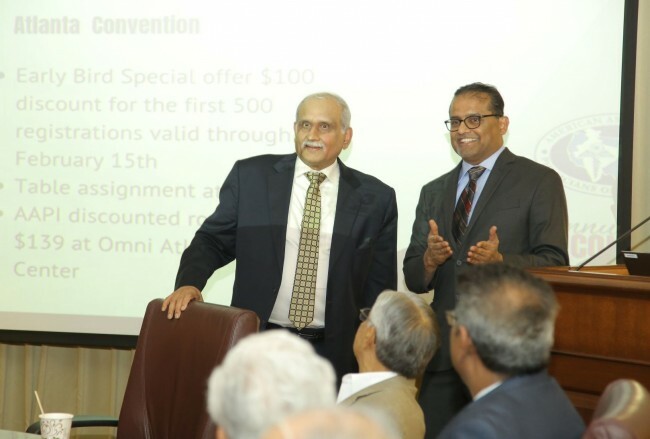 “The AAPI Convention provides an opportunity for delegates to meet directly with these physicians who are leaders in their fields and play an integral part in the decision-making process regarding new products and services,” said Dr. Sudhakar Jonnalagadda. In addition to consumers of medical and pharmaceutical products, devices and equipment, practice-related services, financial services, office supplies, etc., can also meet senior members of management who influence such health care facilities. The 37th AAPI Atlanta Convention is where you can reach your target audience of several thousand under one roof. Register now and aggrandize your marketing plans. According to Dr. Syamala Erramilli, the AAPI convention will offer over 12 hours of CME credits. Scientific presentations, exhibits, and product theatre presentations will highlight the newest advances inpatient care, medical technology, and practice management issues across multiple medical specialties. In a paradigm shift, the convention will explore a Symposium and/or Workshop format that will focus on current issues in the clinical management of chronic disease conditions to include evidence-based guidelines, latest therapies, and hot topics. They will also include 1-2 sessions that will count for Ethics CME that can fulfil mandatory medical license renewal requirements in most states. Dr Naresh Parikh (left) and Dr Sreeni Gangasani. This convention has been always one of the much awaited events of the year, there will be an Educational session with CME by world renowned faculty, full entertainment by Bollywood celebrates, many religious/cultural Activates and many more. AAPI convention offers customized and exclusive sponsorship packages to meet the needs of sponsors and supporters. There are many Exciting A-Z Registration Packages like Bronze, Silver, Gold, Platinum and Diamond Ranging from $50,000 – $250,000. Exhibiting with AAPI gives an opportunity to access nearly 2,000 health professionals who are leaders and decision-makers regarding new products and services, Access to national and international health policy advisors. The physicians attending this convention have excelled in different specialties and sub-specialties and occupy high positions as faculty members of medical schools, heads of departments, and executives of hospital staff. AAPI represents the interests of 80,000 physicians including 20,000 medical students, residents, and fellows. Over 2,500 attendees along with guests are expected to gather at the 37th Annual AAPI Convention in Atlanta,GA. The Team has discussed all the exciting news, updates, action plans for the upcoming event, assigned and confirmed the roles and responsibilities of members in the team. Early Bird Specials for AAPI members to save on the cost for registering early on to attend the convention will be announced shortly. AAPI was founded in 1982 by a group of concerned Indian American medical professionals with a simple goal, to deal with the challenges around immigration and licensing issues facing by foreign medical graduates and to design a level field for them. It is the largest non-profit ethnic medical organization in the United States, one out of seven patient encounters in America is with an Indian American physician, AAPI serves as an umbrella organization with a network of over 160 component chapters including alumni, regional ,state, and specialty organizations.